Are Low Emission Zones (LEZs) helpful for air quality? In many European cities, air quality is not sufficient to satisfy the EU legal limit value criteria for particulate matter (PM10) and NOx. A main source of particulate matter in European cities is motor traffic. Low Emission Zones (LEZs) are an attempt by cities to facilitate the conversion of the vehicle fleet towards low-emission vehicles. The main target is to reduce emissions originating from vehicular exhaust gas. These measurements are particularly sensitive to particles contained in the vehicular exhaust gas, and therefore a valuable addition to the suite of legal standard PM measurements. Decrease in Black Carbon mass concentration at the air quality site Leipzig-Mitte between 2010 and 2015, Source: TROPOS. Our study could detect a significant decrease in black carbon (BC) mass concentrations in Leipzig urban air since 2011. For instance, there was a decrease of roadside BC by a half at the monitoring station Leipzig-Mitte (see Figure above). While the greatest drop in concentrations could be observed from 2010 to 2011, concentrations further decreased from 2012 to 2015. The study suggests that this decrease is, besides a modernisation of the vehicle fleet, the result of traffic volume changes associated with the introduction of the LEZ. Expecially heavy duty vehicles seem to avoid passage through Leipzig now. While BC decreased since 2010, the same could not be observed for PM10. Soot (BC) represents only a minor fraction of PM10. However, soot has been associated with significant health effects in the population, and therefore represents one of the more harmful chemical species in PM. 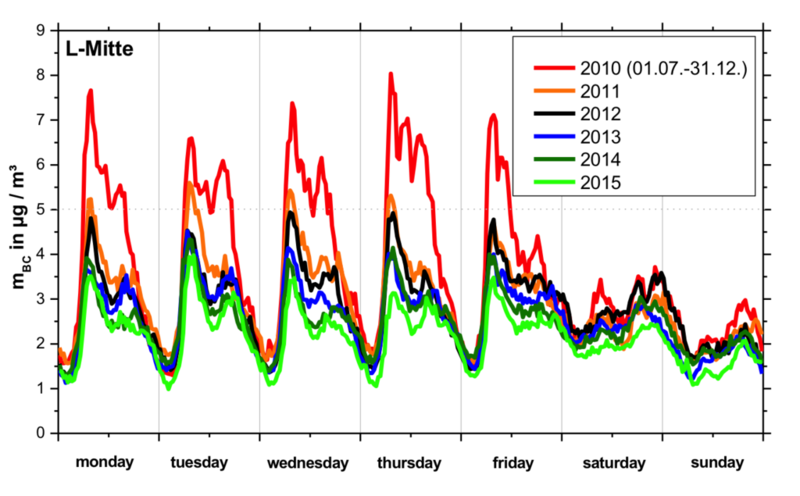 Our measurements illustrate a usefulness LEZ that is not visible from PM10 trends alone. We also suggest that the effectiveness of measures such as the LEZ can be better verified when measuring air quality parameters that are better targetted to vehicle emissions, such as BC. Rasch et al. (2013) Significant reduction of ambient black carbon and particle number in Leipzig as a result of the low emission zone. Download PDF courtesy of SPRINGER-VDI-VERLAG, 2013. Alfred Wiedensohler: "Umweltzone und schwarzer Kohlenstoffs in Leipzig", Vortrag beim Umweltstammtisch in Leipzig, Oktober 2012. Umweltzone Leipzig, Teil 1: Ausgangsbeurteilung. Fachbericht des LfULG mit Beteiligung von TROPOS. Umweltzone Leipzig, Teil 2: Immissionssituation 2011. Fachbericht des LfULG mit Beteiligung von TROPOS. 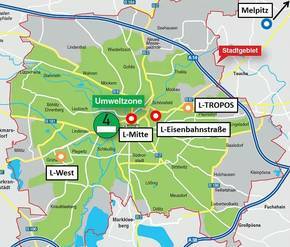 Umweltzone Leipzig, Teil 3: Immissionssituation 2010-2013. Fachbericht des LfULG mit Beteiligung von TROPOS.